San Jose police launched an investigation into the threatening letter Thursday night after the imam at the Evergreen Islamic Center found it in the mail. The leaders of two Southern California mosques, the Long Beach Islamic Center and the Islamic Center of Claremont, said they received the same letter. Each of the letters was signed by “Americans for a Better Way.” Authorities have not stated whether they have determined who is behind the letters. San Jose police are treating the letter as a “hate-motivated incident,” spokesman Sgt. Enrique Garcia said. Faisal Yazadi, the president of the San Jose mosque’s board of directors, said he hoped the person who sent the letter would engage in a conversation with their community. Tarek Mohamed, the chairman of the Long Beach mosque, said the situation warranted FBI involvement. Zaire Biloo, the executive director of the Bay Area chapter of the Council on American-Islamic Relations, said Trump’s campaign promises and rhetoric made some of the president-elect’s supporters feel validated in their Islamophobic views. O.k. Let us take into account the things we notice in the letter, before we jump to any conclusions. First of all, I noticed very few misspelled words. Secondly, the handwriting is actually fairly neat. Well much more so than my own. Third, there is an obvious lack of grammatical skill, so much so that the average person cannot miss it. Fourth, there are references to the devil, cleansing, sherriff, Trump, filth, whores, dogs, Satan, America, patriotism, Hitler, jews, and a strange capitalization of the word Dodge at the end of a sentence, come to think of it, there is a strange lack of appreciation for capitalization throughout. Fifth, this was delivered to several different mosques in several different cities, San Jose, Long beach, and Clairmont. This would lead someone to believe that this person has a decent car, money for gas, with alot of free time on thier hands, or there is simply more than one person involved. Sixth, if you look closely at the bottom of the page it has a line that makes this look like a copy, also the holes and side are copied if you look closely. 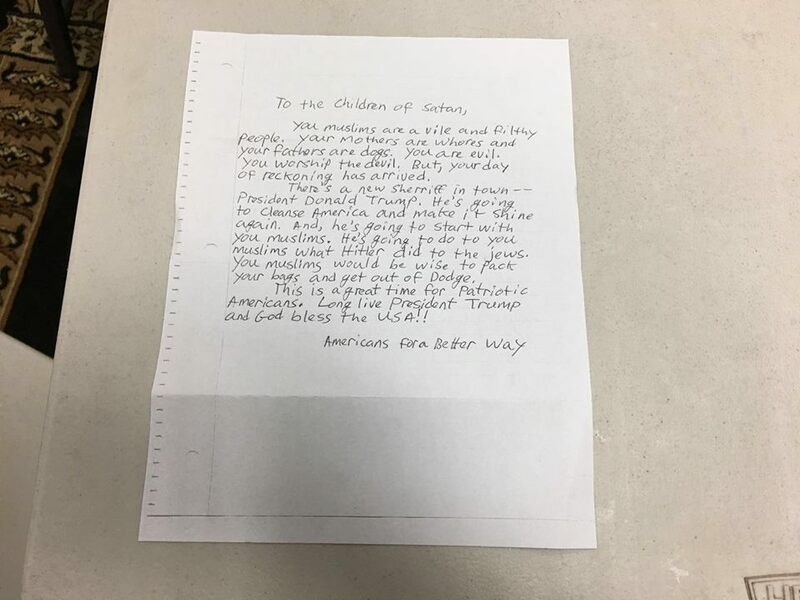 If this was indeed a picture of the original, one must assume that this letter was copied and that there is a possibility that the original might have been delivered to one of the two other mosques. If it is an original and there was not an original delivered to either of the other two mosques, we can assume that this person is not a rank amature and they are attempting to avoid forensic analysis. Seventh, certain loops and curves are feminine looking and the strange enlarging of the script seems somehow done on purpose, but one cannot verify these things and seventh is purely speculative. Eighth, and I cannot stress this enough, one should not jump to any speculative conclusions. All evidence should be given full credibility until it can otherwise be verified as a hoax. I hope this helps people to come to a calm understanding. Remember, if there is genuine disinformation or misinformation ( mind attack ), it does not help to fuel speculation. Always, and I mean always assume the e idence is real until the lack of credibility surfaces. It does not help, if the evidence is real or not, to detract from reality and embed oneself into fantasy that things are always disinfo. I AM outraged! I am sick of any low life freak speaking for us”Americans”? It takes all ethnicities to create “Americans”. I am sick of these close minded idiots pontificating in the name of “Trump”. Why even give it any press? I am divided over the media nurturing these Hate messages. Why give them any press at all? You just know whoever did this is over pleased to see it in the papers. Some low life hateful Tweek jumping up and down getting his 15 min of fame, With pats on his back from his brainwashed dullard buddies. His claim to fame comes cheap. Instead of truly accomplishing greatness by positive actions, he demotes us all by his sickening banter. Really, Central Coast folks?? Do you think that being a high school aged person, if that is how you justify such letters, is an excuse for harboring such hate (just where do you think that hate stems from?)? Do you think that the intellect of such a writer makes him/her any less capable of reigning down terror? You are making excuses for the very worst character trait in God’s universe – hate. Shame on you!! Where is your outrage?? I wish the terrorists and Jihadists would stop at sending nasty letters. There is more truth in your observation than most might think. Someone has sunk to a new all time low with this nefarious scheme. Hope they are appropriately rewarded with public humiliation and jail time. Not buying it…especially with the adult manner in which Trump supporters have behaved compared to the way some on the left are behaving. Recounts that will do nothing but undermine Trumps presidential election and further divide the nation. Calls to end the electoral college. People calling Trump a racist and a KKK member. Sorry Evergreen Islamic Center we just ain’t buying it. We need more than a hand written piece of notebook paper to convince us that your fears are not just Trumped up! No pun intended. I say this may be a “foul”. This could be a textbook example of how the “oppressed” can raise awareness of their cause-send a letter using the type of language your enemy would use. The problem is that the letter as written does not sound like what I would have expected, its close, but not quite there. Hopefully the authorities will find whoever wrote it and throw the book at them, regardless of which side the person(s) stand on the issue. Does anyone really think Pres-elect Trump has any knowledge of this? The best way to do harm to people is to warn them? This smacks of some poor blank HS dropout that is worried about his McDonalds career being interfered with. The “your mothers are whores and your fathers are dogs” is not typical for a HS dropout. There is a pointed lack of obscenities in the letter as well, which would be more typical of a “standard white supremacist of limited intellect”. I mean, those are honestly the types of insults that would be more standard in the Middle East. I would be shocked if this letter is legitimate. The wording just seems more like a ruse to me. Then again, who am I to say anything? Especially since the poor Islamic refugees are ONLY coming here to live peacefully and assimilate and be good patriotic Americans. Just remember, ignore all the hate crimes and human rights violations that happen on a daily basis in the name of Islam, and the almighty “Prophet” Muhammad. Ah yes, the alt-right is alive and well here at Cal Coast News.